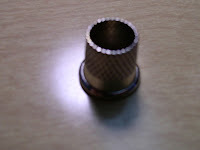 Tailor's thimble, the only kind I use. As a seamstress, a thimble is used everyday at work. The picture is a little blurry, but you can see that there is a hole at the top. The side is used to push the needle through the fabric. 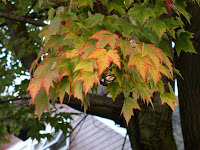 The leaves are so pretty this time of year, I have taken lots of pictures. Here are a few. 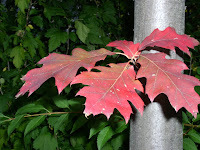 I rarely see oak leaves that are red, usually they are brown. I've been sewing dresses for customers. There have been a lot of them recently. I like that! It brings i n cash. One of my customers is a young violinist who need performance clothes suitable for a teenager. 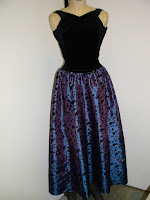 The dress with the blue skirt is new, but I've been storing the fabric in my shop for 2 years. 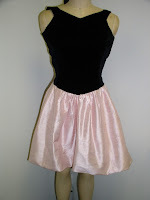 It's taffeta with black velvet flowers. The top is stretch velvet. I also altered a dress from a couple of years ago. It had go tten too short. I show before and after pictures. 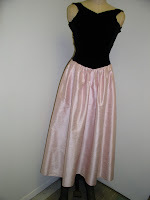 The skirt on this is silk duipioni. She needs dresses for less formal performances too. I showed a short dress with a ruffle last post. This one now has a bubble skirt. Finally, the camera was held straight. I have a leaning dress form, but this one isn't it! We have finished socks. LE's birthday socks are finished. They're a stealth project, because I hope to sell the pattern. but I can show enough to see that they're done! 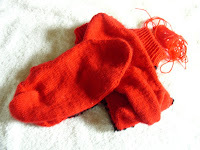 I show all the leftover red yarn. Really didn't think I'd make it. You can see the feet and the ribbing. Yes, the pattern is black.